Just for blog reader Mariner1, here's another #5 Seattle minor leaguer. Those expansion-era uniforms really jump off the card! Seattle drafted Mr. Chelette (one el, error by the team or card maker) in 1979's 30th round (full record at Baseball-Reference.com), the same year they chose eventual big-league successes Bud Black and Tom Henke. Unfortunately, Mark never reached higher than single-A, so appeared on only 2 baseball cards, this San Jose example in 1980 and Wausau in 1981. It almost goes with saying that Bud Black and Tom Henke succeeded with teams other than Seattle. Black won a World Series ring with KC (1985) and Henke picked one up as a Blue Jay (1992). 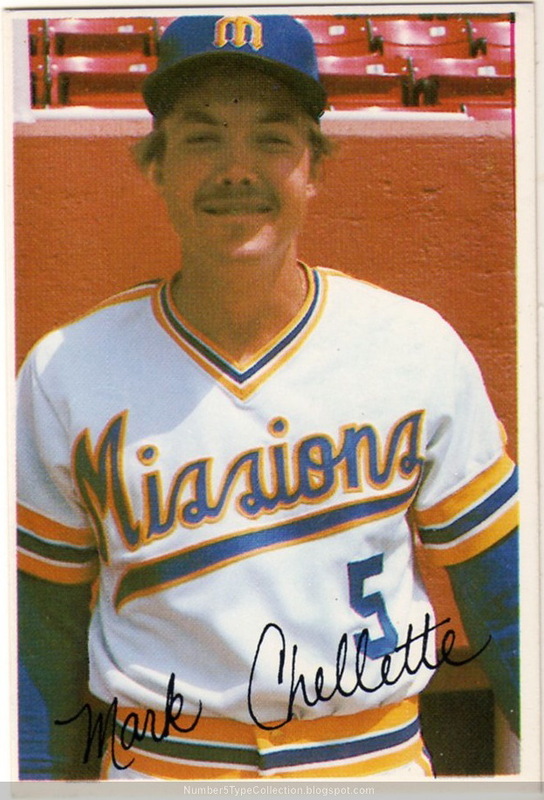 By 1981, Chelette must've seen the end of his playing days coming. Nominally a player, he attended the Midwest League All-Star game as an assistant for team manager Bill Plummer. After 13 more games at Bakersfield in 1982 (and only 10 in the field), I assume Mark moved to the bench full-time or retired to other pursuits. 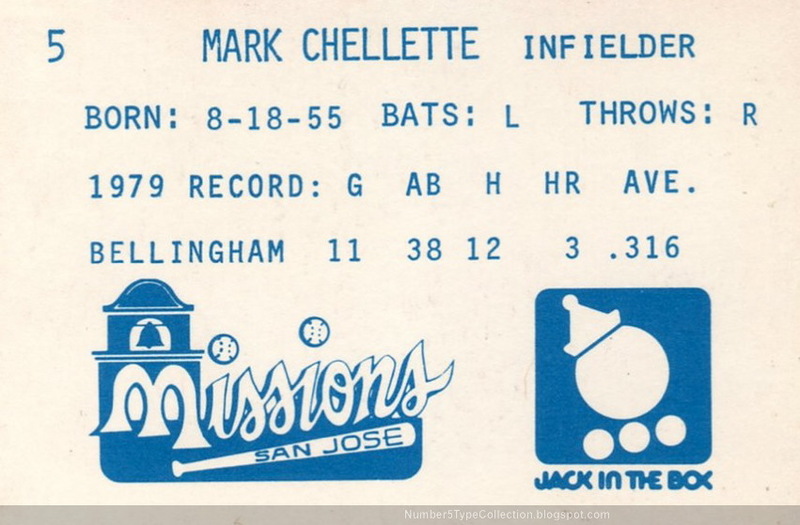 It was tough to find info on Mr. Chelette at first, as some stats track his first name (John, as at B-R.com) and others his "playing" name (Mark). The vagaries of pre-Internet minor league record-keeping can make for challenging research! Value: Got this on MinorLeagueSingles.com for about $2, about right for 1980s players. Fake / reprints: You can't fake a smile like Mr. Chellette's and neither have I seen any reprints in the market.